I took Solimar to her allergist appt and her environmental allergies have been confirmed to have taken a turn for the worse. Solimar is not allowed to go outside for the next couple of days and she has been put on 5 medications. She looks 100% better. Although I am more of a holistic avenue girl. I couldnt let my baby suffer. She feels and acts like her old self again. She will get her skin tested in May. She gets this done 1-2 times a year. This test is done by placing a drop of a solution containing a possible allergen on the skin, and a series of scratches or needle pricks allows the solution to enter the skin. If the skin develops a red, raised itchy area (called a wheal), it usually means that the person is allergic to that allergen. NOT FUN! Then we go to Toys R US because although she is not spoiled this is one of the times she can go and have whatever she wants. I will let you know how that test goes. 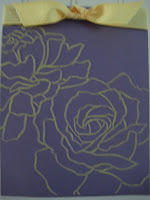 I made this card for LNS RAK...I left this one without a sentiment but I used different sentiments for the ladies I mailed these too. This was cased from pcgaynor over at SCS. 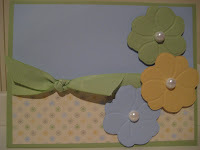 The only difference is I didnt emboss my Bashful Blue and her flowers are debossed side up. 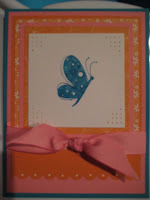 You can view her card here. Well it has certainly been CRAZY in the Gutierrez Family house. My daughter for those of you who don't know has severe food allergies and really bad environmental allergies. Well her environmental allergies took a turn for the worse. Since Friday she has been complaining of itches, her eyes were blood shot but I gave her benydryl and her clarinex. But yesterday she went outside for less than 5 minutes and she had welts all over her face and body and her right eye was swollen shut. Solimar is only 4 years old...So off to the emergency room. So I have an allergy appt this morning. Will update you later. Mark April 27th on your calendars! That's the date when you can hop onto Diane McCormack's blog to see examples of projects made with the Occasions Mini Catalog stamp "Soft Summer"!But wait, there's more! This will be a banquet of ideas and beautiful projects. There are 20 stops on this tour, and you won't want to miss a single one!! The links will be available only on April 27th, so please don't miss out! So pack your bags you're going to love this trip! This tour will take you all over the place without leaving your couch! I am part of the LNS Rak Team. 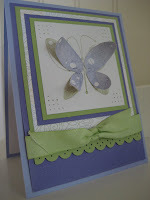 I made this card for a couple of ladies in our yahoo group LateNightStampers. You can join here. This is a group of Stampin' Up demonstrators and their friends who love stampin. Many have gone or are going to SU Convention and Leadership events. We enjoy sharing inspirational ideas as well as samples of all our works of heart. We look forward to you being part of our "family". 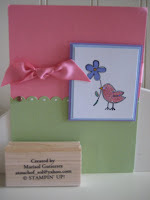 Sherrill Graff is our group mom and you can view her blog here and here. PS Do you like my new stamp. I feel official.